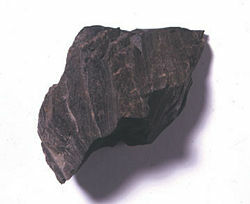 Shale is the most common sedimentary rock. It is a fine-grained rock that is formed from clays or muds. Shales contain fossils and often form reservoirs of petroleum and other hydrocarbons. These rocks are also used as construction material. Shale is characterized by thin laminae breaking with an irregular curving fracture, often splintery and usually parallel to the often-indistinguishable bedding plane. This property is called fissility. Non-fissile rocks of similar composition but made of particles smaller than .0625 millimeters are described as mudstones. Rocks with similar particle sizes but less clay (and therefore grittier) are known as siltstones. 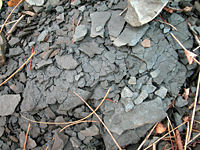 The process in the rock cycle that forms shale is compaction. The fine particles that compose shale can remain suspended in air long after the larger and denser particles of sand have deposited out. Shales are typically deposited in very slow moving water and are often found in lake and lagoonal deposits, in river deltas, on floodplains and offshore of beach sands. They can also be deposited on the continental shelf, in relatively deep, quiet water. Black shales are dark, as a result of being especially rich in unoxidized carbon. 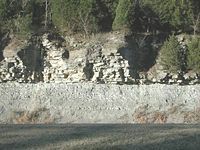 Common in some Paleozoic and Mesozoic strata, black shales were deposited in anoxic, reducing environments, such as in stagnant water columns (such as oil shale). Fossils, animal tracks/burrows and even raindrop impact craters are sometimes preserved on shale bedding surfaces. Shales may also contain concretions. Shales that are subject to heat and pressure alter into a hard, fissile, and metamorphic material known as slate, which is often used in building construction. ↑ Rocks: Materials of the Lithosphere: Summary, Pearson Education. Retrieved August 29, 2007. This page was last modified on 11 September 2015, at 14:58.